Downton Abbey, like many great British family sagas, features a wicked nanny. Did you see the austere portrait of Queen Mary in the servants’ quarters downstairs? That was Wicked Nanny’s cue. 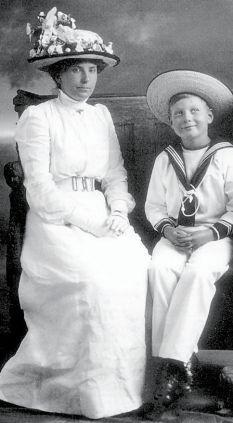 Mary of Teck’s trials with nannies were recorded by her oldest son, the abdicating Edward VIII. According to him, one had been dismissed for insolence, another for abuse. Both boys were allegedly pinched to make them cry so that a return trip to the nursery was necessary. Little Bertie might have been starved. All were reported by an assistant, the undernurse, Nanny Bill. In Downton Abbey, Nanny West got sacked for calling Sybil’s daughter a “wicked little cross-breed.” Her role was rather brief. I suspect she was a device to set up the viewer’s sympathy for her successor, who very well may do something really naughty. Nannies during the Regency used to be called nurses. They had enormous influence over their young charges in the nursery. Happy was the family who could trust such a servant, and having found one they might retain her to stay on for future generations. Nurses figured largely in the literature of the time. They might be intimate confidantes, mentors, or providers of safe refuge for their former charges, now grown up yet fleeing to them in times of adversity. My favorite nurse from the Regency is featured in Heyer’s Sylvester, or the Wicked Uncle. Even when she is not in the scene, Nurse’s absence is rendered quite acute. The sobs ceased abruptly; Edmund emerged from the blanket, tearstained but joyful. ‘Button, Button,’ he cried, stretching out his arms. Sir Nugent put the button into his hand. There was a moment’s silence, while Edmund, staring at this trophy, realized to the full Sir Nugent’s perfidy. To blinding disappointment was added just rage. His eyes blazing through his tears he hurled the button from him, and casting himself face downward gave way to his emotions….